Songs of Eretz Poetry Review is pleased to present “Fly Fishing on Blue River” by Ron Wallace. Mr. Wallace is an adjunct professor of English at Southeastern Oklahoma State University and the author of seven collections of poetry published by TJMF Publishing of Clarksville, Indiana. Wallace was a three time-finalist in the Oklahoma Book Awards and is a three-time winner of The Oklahoma Writer’s Federation Best Book of Poetry Award. His work has been recently featured in: Oklahoma Today, The Long Islander, Concho River Review, cybersoleil journal, Cobalt, Red Earth Review, Dragon Poets Review, Sugar Mule, Cross-timbers, Gris-Gris, Oklahoma Poems and Their Poets, and a number of other magazines and anthologies. mark the tattered edges of the world. and the air is slowly cooling. against the coming of night on the water. Poets Notes: My big brother loved all fishing, but especially, fly-fishing on Blue River near Tishomingo, Oklahoma. He was twenty years older than I, serving in the Korean War when I was born, but like most big brothers who love their baby brothers, he was always there for me once he was back home. Floyd lost his battle with lung cancer in October of 2012. 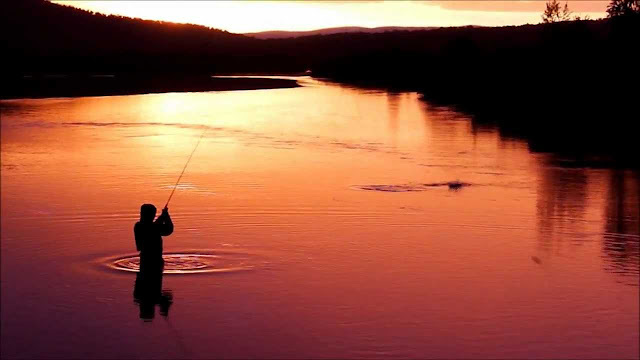 I was heart-broken, but at his service I saw a picture of him fly fishing, just a silhouette on the water as the sun was setting, and the heart of this poem was born. I like to think of him still casting those lures he made, still whipping that line out from his favorite fly rod. I did my best to capture the image I hold of him doing what he loved so much, and I consider this poem my tribute to him and the times we spent together. Editor’s Note: I enjoy the poet’s use of alliteration here, as well as the crisp imagery that he creates--a magical moment and a beautiful and fitting elegy. “Fly Fishing on Blue River” was first published in the November/December 2014 edition of Oklahoma Today and was a finalist in the most recent Songs of Eretz Poetry Award Contest.